Most home handymen will do some of their own electrical work. Following are the 10 most common electrical wiring mistakes made. In correct wiring and/or wiring techniques can cause home fires. It is important that anyone who undertakes their own electrical wiring know and understand the basic rules of electrical safety to avoid costly mistakes. Electrical wires are color coded, as shown in Figure 1. White is for the neutral line and red and black are for live wires. Although many electrical circuits will appear to work even though neutral and live wires have been reversed, when reversed you are creating a situation where it is easy for someone to receive a shock. Secondarily, many electrical devices have the plugs keyed (larger prong for the neutral wire) to ensure that the integrity of the live wire is carried through to the electrical device. In some cases you can damage the appliance or electrical device by not maintaining the integrity of the neutral and live wires. Most switches, outlets and receptacles have color coded screws to aid in connecting the correct colored wire to the right screw. Dark colored screws (bronze) are for live wires. Light colored screws (silver) are for neutral wires and green colored screws are for ground wires. 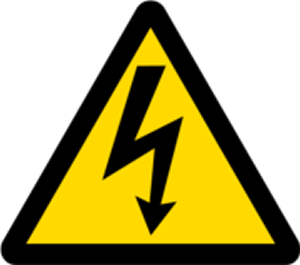 The gauge of the electrical wire determines who much current (amps) the wire can safely carry without overheating. In homes a number of different gauge wires are used to deliver power to electrical receptacles and appliances. Basic 15 amp electrical circuits must use a minimum of 14 gauge wires if copper wire is used and 12 gauge wires if aluminum wire is used. For a 20 amp electrical circuit you need to use 12 gauge wires if copper wire is used and 10 gauge wires if aluminum wire is used. Additional wire gauge sizes for electrical devices and appliances. There are three basic facts that determine the amount of current that a circuit can safely deliver. The rating of the electrical outlet or receptacle that allows the appliance to be connected to the electrical circuit. You cannot safely change one of these three items without replacing all of the items. If you increase the size of the circuit breaker of fuse without replacing the size of the wire you have created a situation that may cause a wire to overheat and hence cause a fire. Note: Electrical receptacles and outlets will have their current rating molded into the plastic body and will also state the type of wire, aluminum and/or copper that can be used. A standard duplex receptacle can be rated for 15 or 20 amps and can be rated for aluminum, copper or copper/aluminum wire. You will not see any noticeable difference in the appearance of these devices. The right device MUST be used for each specific situation. The addition of the bare copper wire in a cable is for the safety of you and your family. However, it only provides safety if it is used and used properly. All metal electrical boxes, switches and outlets must have a ground wire connected to them. Ground wires must be joined together in the electrical box to ensure that the ground has continuity from one electrical box and device to another. Many home handymen will not bother to connect the ground wire to electrical devices or not bother to connect ground wires together to ensure continuity.